Thread: Tandon TM-62-2L , heads won't move . Hi, I'm putting together a "twinner" box based on DFI i810 chipset mobo (only one I have that supports 2 floppy drives). Idea is to have all 3 common floppy formats in one convenient box, 360Kb 5.25", 1.2Mb 5.25" and 1.44Mb 3.5". The problem of having all 3 solved by buying a LS120 drive on ebay, actually it's a scsi drive but the adapter board it's easily removable so what I'm actually using is a plain vanilla IDE LS-120 that also doubles as a third floppy ( windows 98 recognized it no problem and assigned letter d .
So far so good I thought, brought my pile of 5.25" drives from the basement and started picking the best looking ones to test. 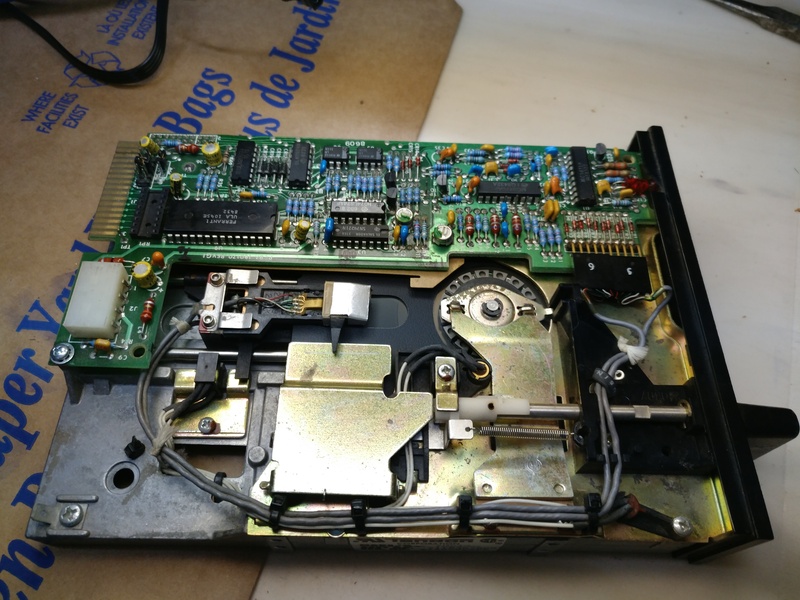 Didn't have any problems picking up a good working 1.2Mb drive, but to my surprise I only found only one 360Kb drive in the pile . .
Needless to say the drive doesn't work properly, the spindle spins but the heads don't move at all ! , it doesn't matter what position I've set the manually before the power up. I've tried all the jumper combinations and they seem to work right ( they do what they're supposed to do according to the manual). Tried it as a DS 1 in both positions on the cable, works fine as far as spindle concerned but the head doesn't move at all, power seems to be OK, capacitors check out good also, I've checked all 3 sensors they're OK too. And that's the moment that I'd like some help guys. either a full service manual or even a schematic only. 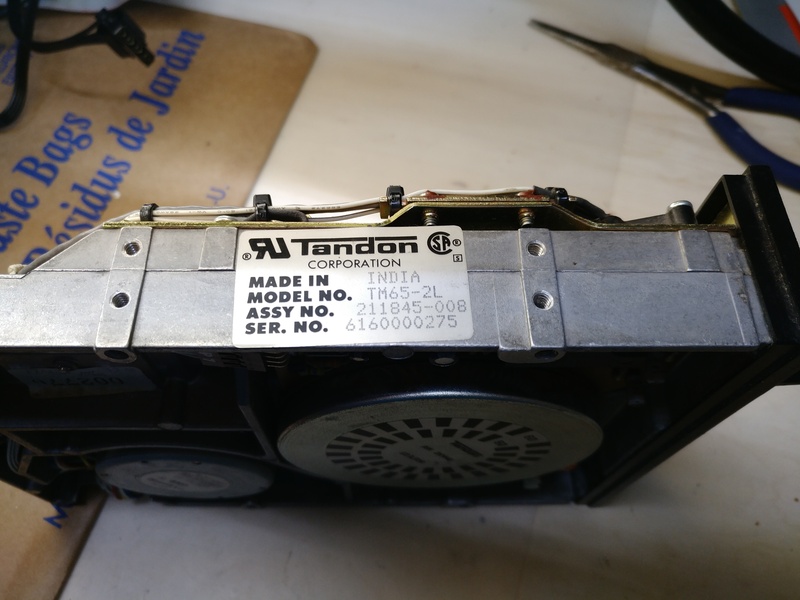 I know some of you specialize in that kind of stuff, pretty sure someone must have it, after all it's, sorry was a quite popular drive and Tandon's service manuals are out there, just couldn't find one for this particular unit. Not that popular, at least in the US. However, I note that there's no terminator. If you have a scope, you may want to probe around the UL2074 (it's a 1.5A Darlington IC) and see what's coming out of it when you step the drive manually (from the edge connector). I assume that you've resistance-checked the stepper to see that there aren't any open windings. Hi, I'm actually typing this from the "tweenner" , just installed XP on the second partition on the CF that passes for the HD, firs time using K-meleon browser, not so bad actually. Back to the problem with the 360 drive, there's no terminator cause it is connected in the middle of the cable, the drive at the end (1.2Mb Chinon FZ-506) has the jumper marked "term" installed. I do have a scope and was poking arround the connector, don't like the signals at all, some like "step" stay steady at ~2V without any signs of pulses at all. That pin goes straight to Ferranti ULA 1045E , granted din't do any major troubleshooting yet), the step motor seems to be OK. I don't know at this moment what to do, if that ula chip is bad I probably have to give it up, on the other hand I have quite a few 1.2Mb drives, may be able to trade a couple for a working 360, who knows. Well that ULA 1045E is a custom gate array, so you may well be out of luck on that one. I was just looking at the photos of your drive's pcb and thinking ..hmmm what would be the most likely part to fail and disable it like that. 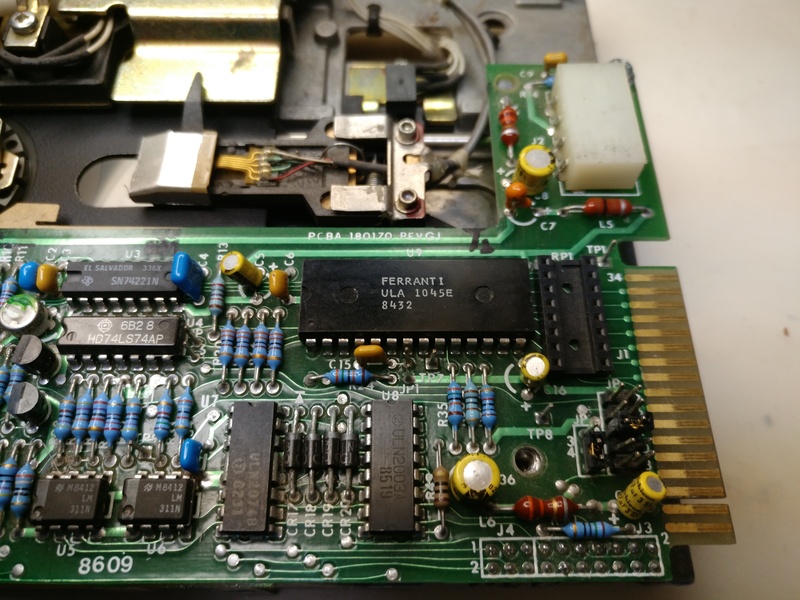 The most unreliable parts on the pcb are probably not the IC's, nor that gate array. I would expect it unlikely that any of the the R's and monolithic ceramic C's would have died. Small electrolytics are probably ok, but you could check them. 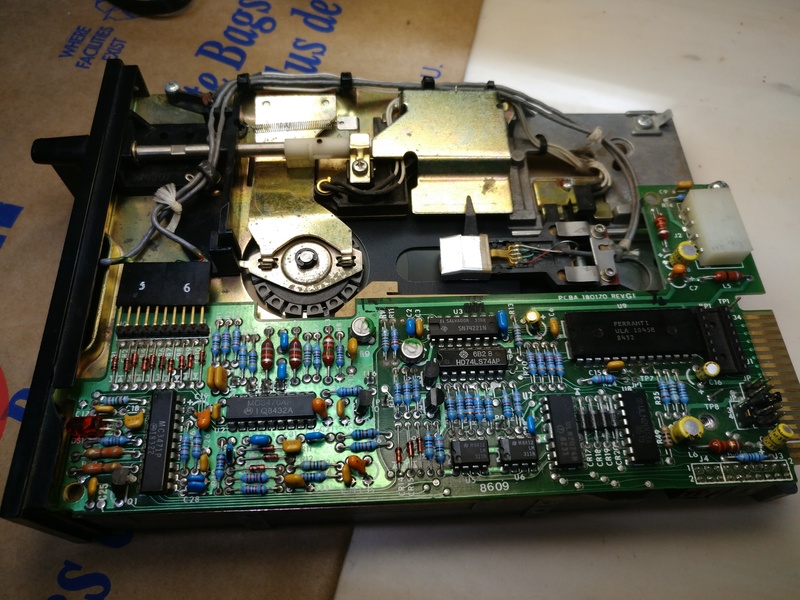 But the first thing I would do is get the meter and check all the chokes on the pcb, L4 , L5 L6 etc for continuity . Those small chokes are normally in series with the power rails to the IC's & sub circuits. They have fairly fine internal wire and can go O/C especially if a tant cap has shorted out, then they act like a fuse. Even without the schematic you can look up the IC's and check that they at least have the correct voltage on their power pins. You might strike it lucky and find what is wrong. Good sugestion, will do it tonight.